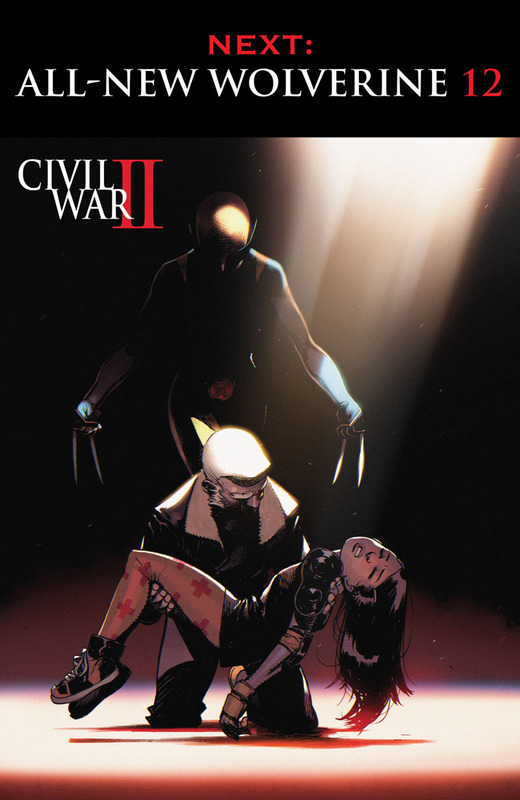 We catch up with Laura Kinney aka X-23 aka the All New Wolverine and her adventures in the new 616, particularly with her role in the current Civil War II storyline happening all across the different Marvel books. 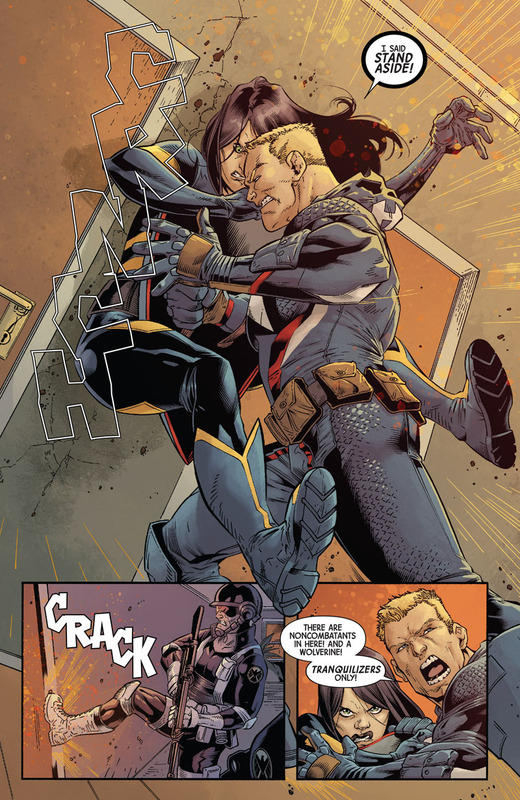 Ladies and gentlemen, All New Wolverine # 11 spoilers. 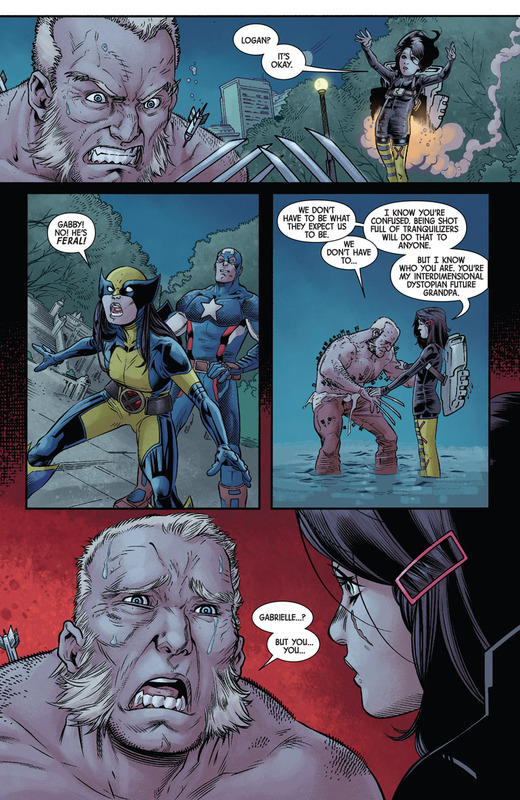 Their mission is to apprehend / isolate Old Man Logan whom Laura finally met a few issues before. 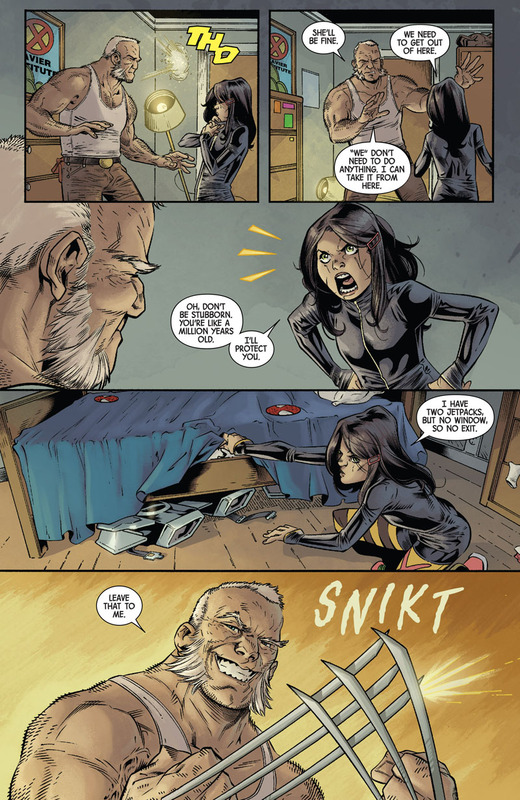 This was her “father” from another dimension after all. 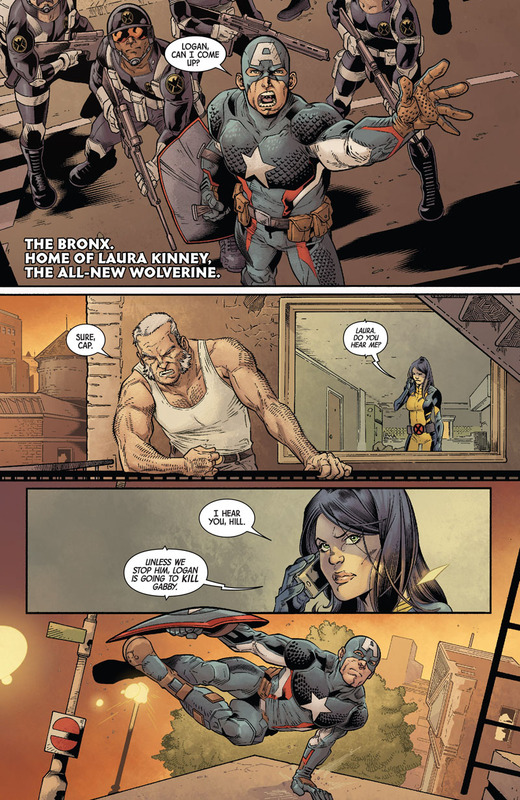 Rogers goes up to Laura’s apartment where he also meets Laura’s “sister” Gabby as well as their pet wolverine. 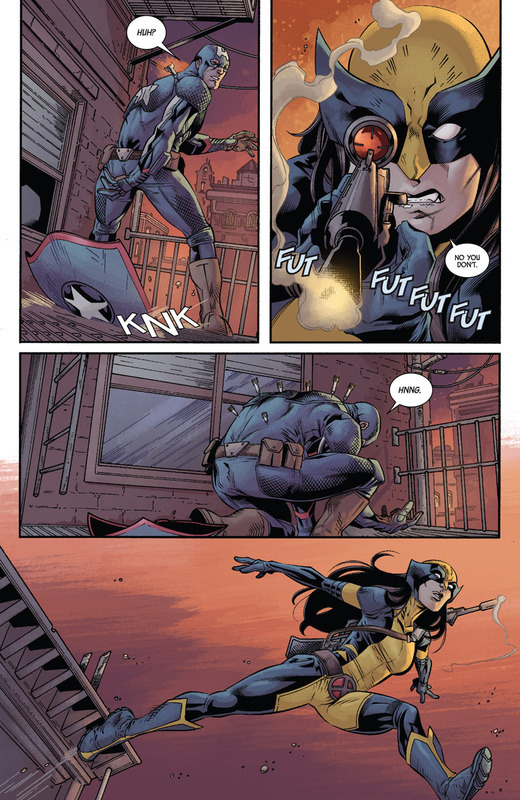 Pretty cool moment they have here where she gets schooled about “gulo gulo” which is latin for wolverine. 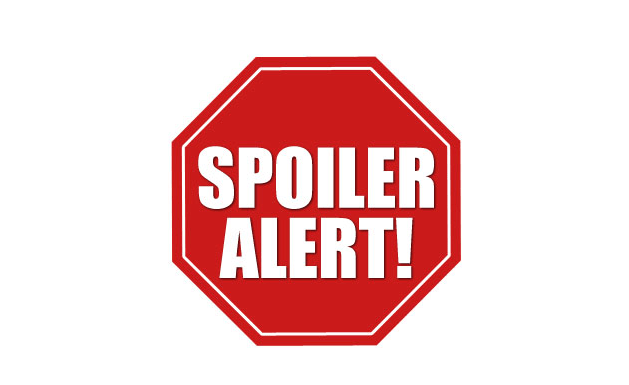 But Steve means business and he wants Logan to come along peacefully because according to Ulyssess, he’s going to be the cause of massive deaths including the death of dear old Gabby. 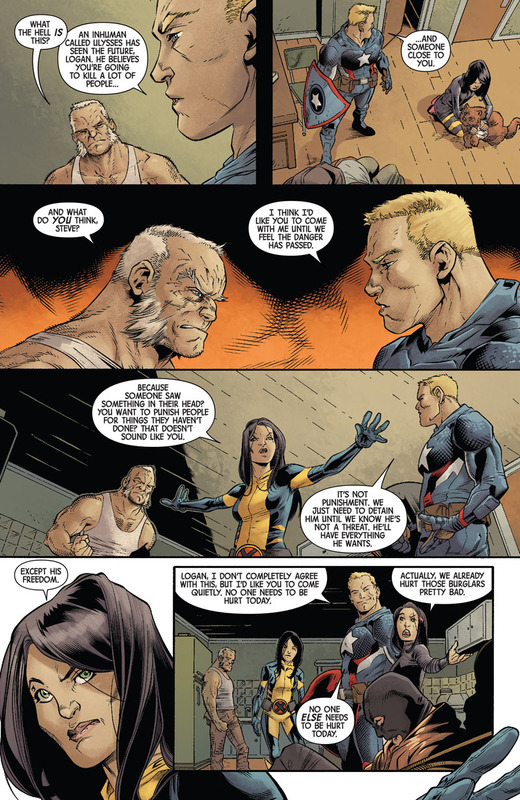 Laura also raises the concept of crime and punishment and how people are losing their freedom over something one person says or “sees”. 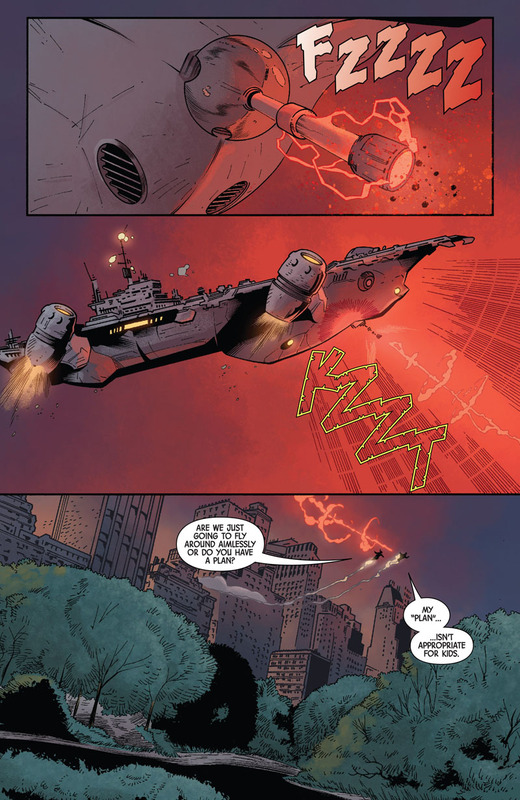 Meanwhile, the pair goes off to escape using SHIELD jetpacks. 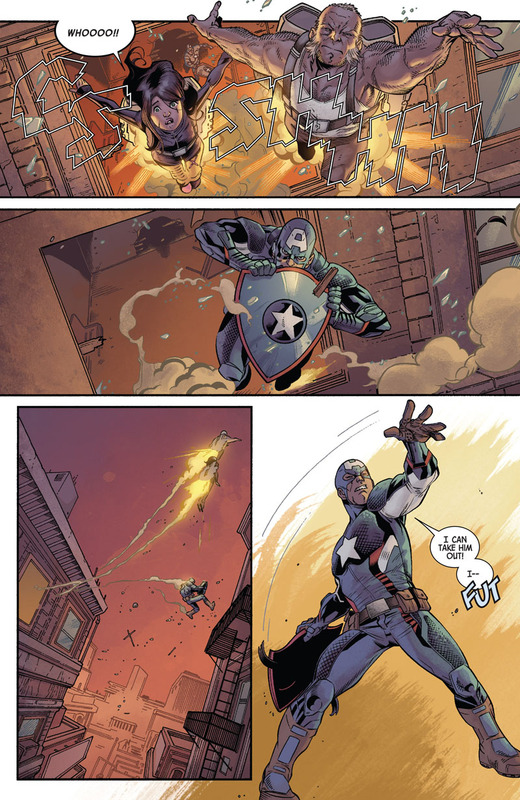 The pair escapes by hacking and slashing across the walls until they get clear from Captain America and the SHIELD soldiers. 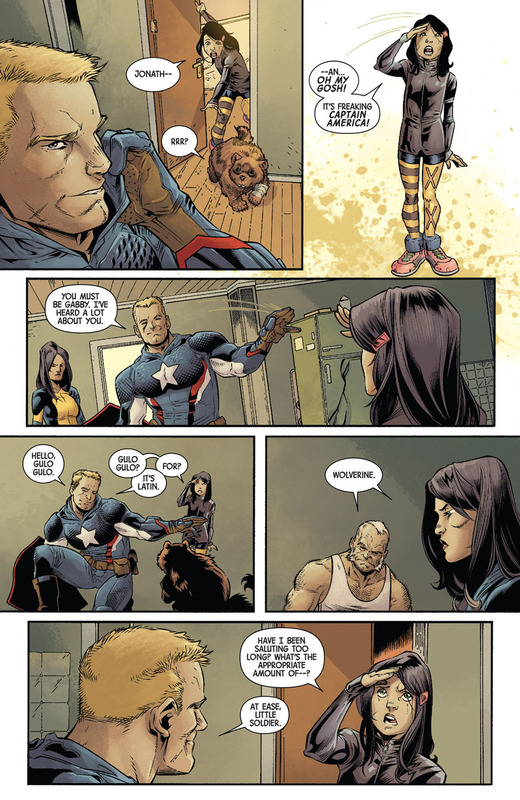 Captain America, being the action hero that he is, manages to catch up with the escaping “father and granddaughter” pair. 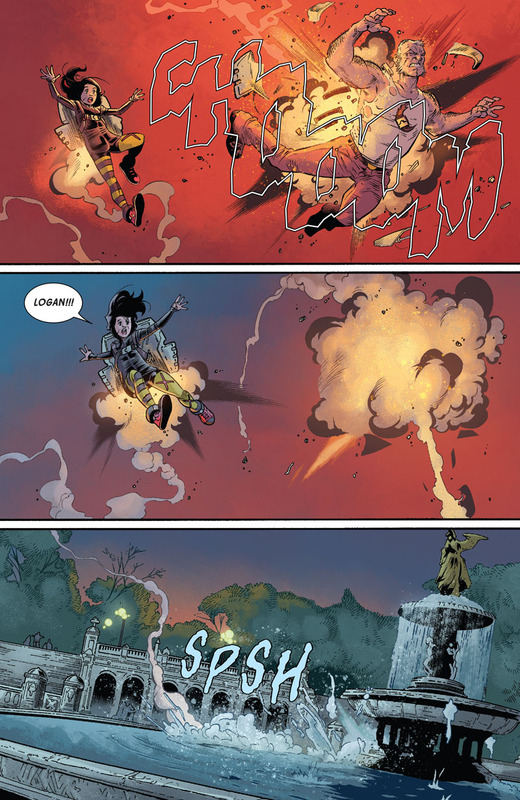 Rogers was about to successfully take the duo down but he gets shot by a tranquilizer gun. 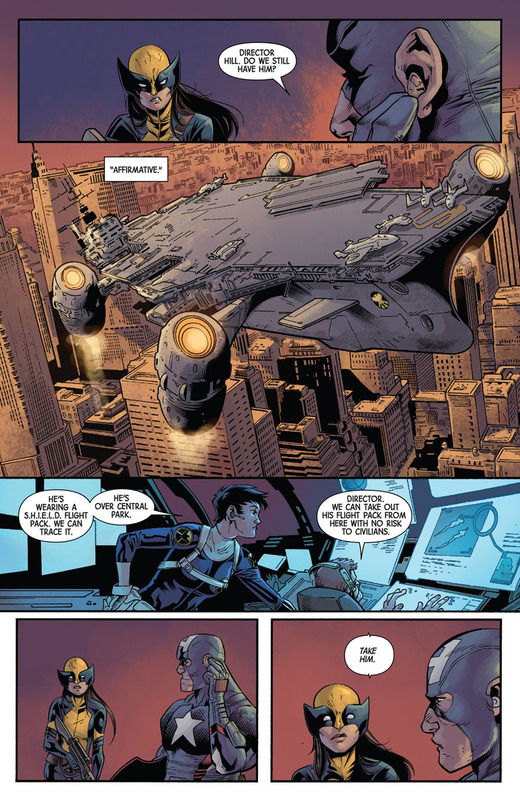 When Laura catches up, Steve finally tells her the vision that Ulysses the Inhuman sees which involves Old Man Logan flying on a jetpack before he kills Gabby. 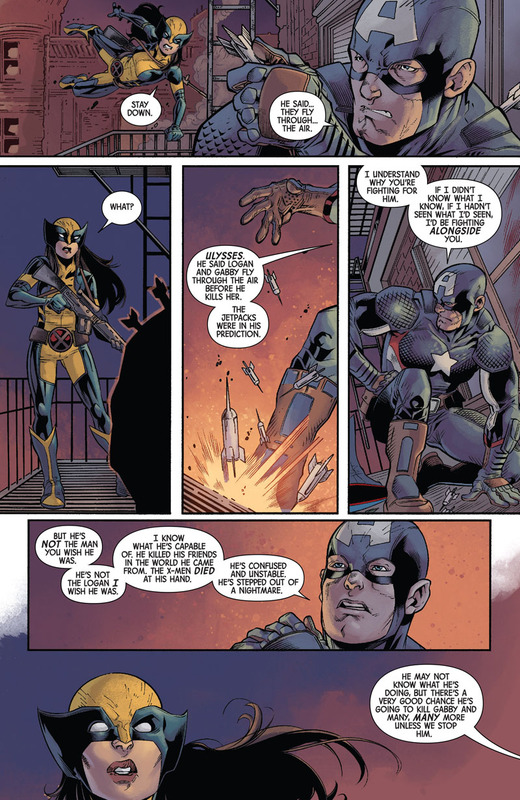 Of course that stops Laura dead on her tracks and gives Cap the chance to order the nearby SHIELD hellicarrier to take Gabby and Logan down. 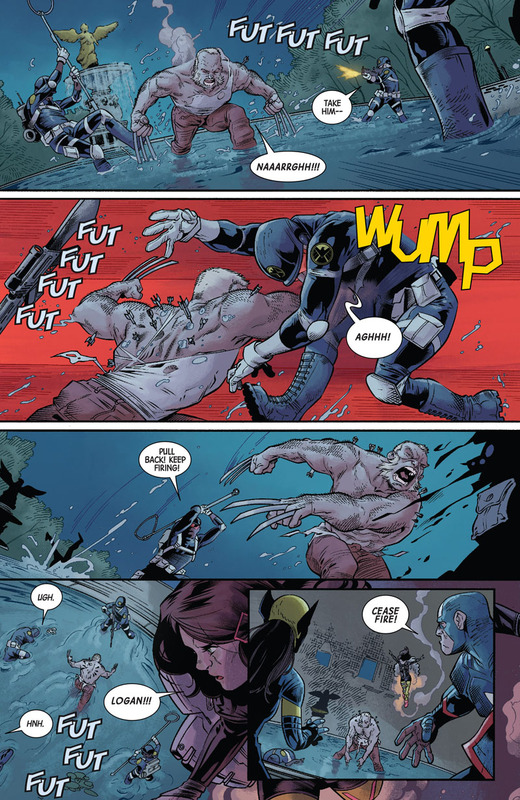 Logan gets hit and lands somewhere in Central Park where a bunch of SHIELD soldiers await and try to capture the dimensionally-displaced Wolverine. 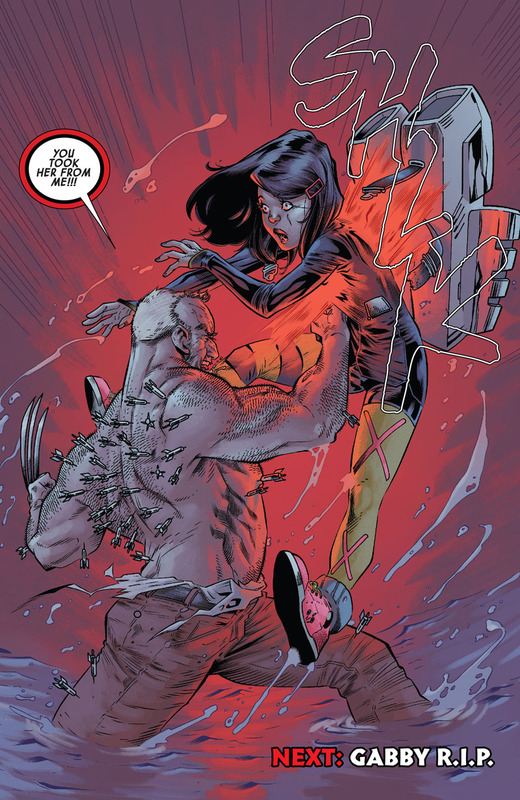 Logan goes full berserker mode thanks to the injuries plus the tranqs that he’s received. Gabby wants to calm him down and approaches, which was really a bad idea. Goddamit Logan! Why’d you do that?!?! Seriously man! 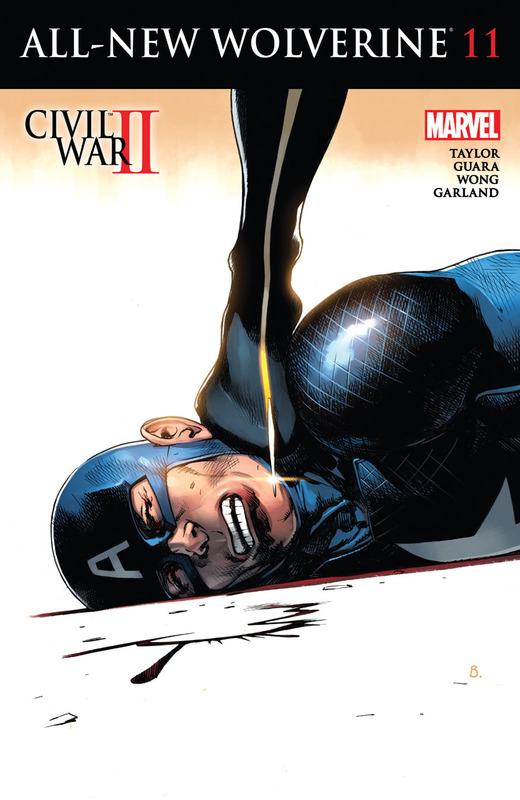 Now we have to wait for next month to see what happens.